Private Lodge on 3 Acres 1 Mile to Town. 6 Bdrm Suites. Colorado at it's finest! Month to Month is also available. Inquire for your rate! Private Year-Round Retreat! Colorado Perfection! This is my favorite lodge; exuding all that you would want a mountain vacation home to offer. If your travel plans allow for a month or so.... Definitely look at The Black Bear Lodge! The Black Bear Lodge is a premier rental home in Breckenridge! 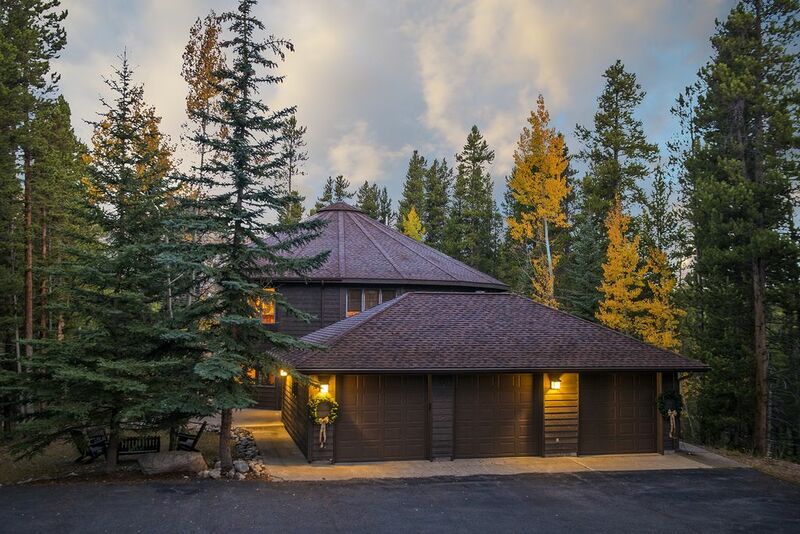 This magnificent Mountain Lodge is private and secluded, yet easy to access and only 1 mile from the Peak 9 lifts and the heart of downtown Breckenridge. Surrounded by tall pines, you still catch ski area views of peaks 8, 9 and 10. Venture outside and experience a mountain stream that runs adjacent to the property and flows year round. Private yet close to everything! The Gondola is just 2 miles from the Black Bear Lodge. Six individually decorated bedroom suites each with cable TV and private baths. Gourmet Kitchen and Dining Area that seats 12. Breakfast Bar with 4 additional seats, 2 wet bars; Heated boot storage; Spacious Living Room with wrap-around decks and views. Large TV in the spacious Great Room, Family Room, 2 stone gas fireplaces, Pool table and foosball in Rec Area; Hot Tub on deck. The Black Bear Lodge is a vacation experience... If you are coming to Breckenridge... You will want to stay here! Summertime: Be sure to visit the Natioanlly Acclaimed Gardens of The Hendrix Home... Right across the street! Born and raised in Pittsburgh, Pennsylvania; I moved to Breckenridge in 1990 to start 'Jane's Lodges' with my Dad Started annual Family Ski Trips over 35 years ago!. We still do one in Breckenridge every year! I used to ride my bike out to this property..... I was always intrigued with this home; A large structure nestled in the pines at the end of a sweeping driveway. If you listen close, you will here the rush or the gurgle of the Blue River which runs just below the home. The privacy of this location is very attractive. Once inside; I was charmed by the decor, layout and design. My Dad always wondered why I just didn't live here.... Pretty awesome. Living in Breckenridge is magical.... if you can spend just a week here; you will definitely experience a little piece of paradise in the Rocky Mountains! We try to create each lodge to exude all of the mountain comforts you would look for while vacationing in our town! The Black Bear Lodge was added to the JanesLodges Portfolio of Homes in 1998. This Property exudes all of the quiet charm you would expect when taking in a Mountain Vacation. Finding nearly 3 private acres of your own so close to the downtown core of Breckenridge is hard to do..... AND walk down to the Blue River from the house???? What more could you ask for? A hidden gem neighborhood.... This is where you will find The Black Bear Lodge. This is our 27th Year operating JanesLodges; and The Black Bear Lodge still takes my breath away. Each Bedroom has it's own Bathroom. The Dining Area consists of 10 seats at the main dining table; 4 stools at the kitchen bar and 4 additional seats at the round table. Wheelchairs accessible on the walk-in level..... Main Living Area is loctaed one story up. 2 Fireplaces, 8 Cable TVs, New Hot Tub, 2 Gas BBQs, Heated Floors, 3 acres, Private, River runs past property, Ski area views, professionally decorated.